SHO-ME 02.6016 MAGNETIC MOUNT BRACKET FOR STANDARD AND SHORT ARROW BOARD. For use with Standard and Short Arrow Boards: 02.6000, 02.6100, 02.6052, 02.6116, 02.6300, 02.6316 and 02.6352. For temporary mounting on flat steel surfaces. Sold in sets of two brackets. Heavy-gauge epoxy coated aluminum. 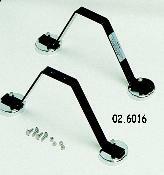 Two 3-inch, 90-pound pull magnets per bracket. Not advised for vehicle speeds over 45 mph. Includes hardware and detailed instructions. 5" H x 3-1/8" W x 16-3/4" L.